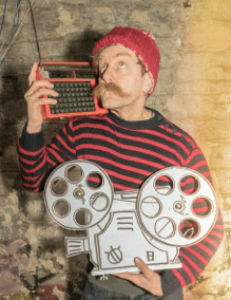 ANARCHIC performance poet Jonny Fluffypunk invites you to join the Inn Crowd at Salisbury and Corsham. The poet, who describes himself as a refugee from suburbia, will be at Salisbury Arts Centre on Thursday 28th February as part of Fest West’s Hip Yak Poetry Shack and at Corsham’s Pound Arts Centre on 1st March, also part of Hip Yak Poetry Shack. In 2018, CAMRA (Campaign for Real Ale) published its latest pub closure statistics, at a rate of 18 per week nationally. The Inn Crowd is a unique project that has been running throughout South East of England, supporting rural pubs to host a variety of spoken word inspired, professional live performances. Working with The Pub is the Hub, The Inn Crowd have collaborated with some of the UK’s top performers to craft new shows especially for pubs which, in turn, have helped landlords attract new customers, widened the experience for their regular punters, and reinforced the pub as a central, vibrant part of community life. Poet Jonny Fluffypunk grew up in the far-flung, forgotten reaches of outer suburbia. In 1984, he was 15. This is a story about being the first punk in the village and the only trainspotter in eyeliner; about unrequited love, youth clubs, John Peel and the forgotten gods of small record shops; about making your own myth and letting go and a million everyday life-changing moments in the back end of nowhere. This is a lo-fi stand-up spoken word performance for anyone who has listened to late-night radio under the bedcovers, or fallen in love, or just been alive! Posted in Words! Words! Words! on 3 February, 2019 .